These were the last days of my introweek and this party was thrown by our GM13 (General Management 2013) students for us newbies GM14 (the 2014 batch of the same). SASSE, the student committee of Stockholm School of Economics (SASSE is more than just a student committee for me, but I’ll do an entire blogpost on that later! 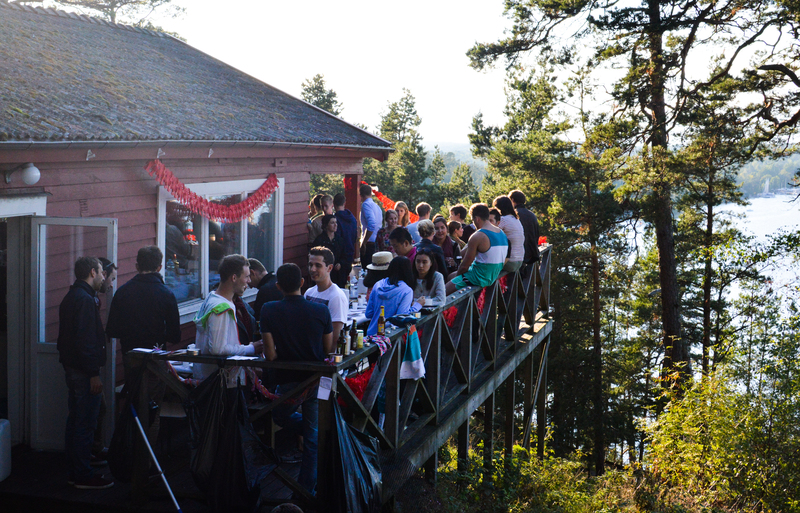 ), actually owns a small cabin on one of the islands in the Stockholm archipelago (Jesus has done a beautiful post on the same, he went Kayaking around the islands for his birthday!) Both the batches just mingled with each other on the way to the island. The view from the cabin was absolutely astounding. It was sunny and there was a lot of water nearby, soooo.. haha you guessed it right, we went swimming! the water was not as cold as my previous swim and I enjoyed a longer swim. The view consisted a part of the city and some small islands around. The sky was so blue and even after a month past the event, I can remember it. I think someone actually swam all the way to another island and came back! 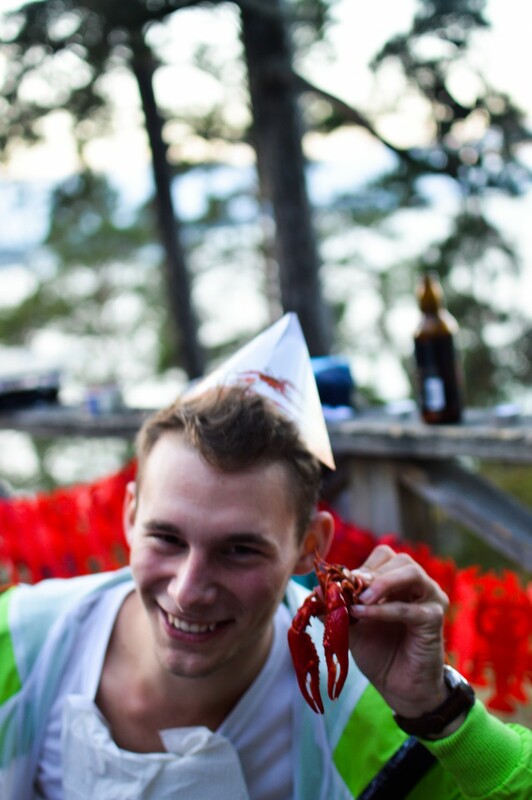 Then the actual crayfish party started! It consisted of a lot of singing, lot of snaps, and lot of crayfish. We were all handed out print outs of some Swedish songs. We sat along a looong table, but apparently the table was not long enough for all of us as we had to really squeeze together for all of us to fit! We also wore the triangular birthday hats. I have no idea why but it was just super fun! 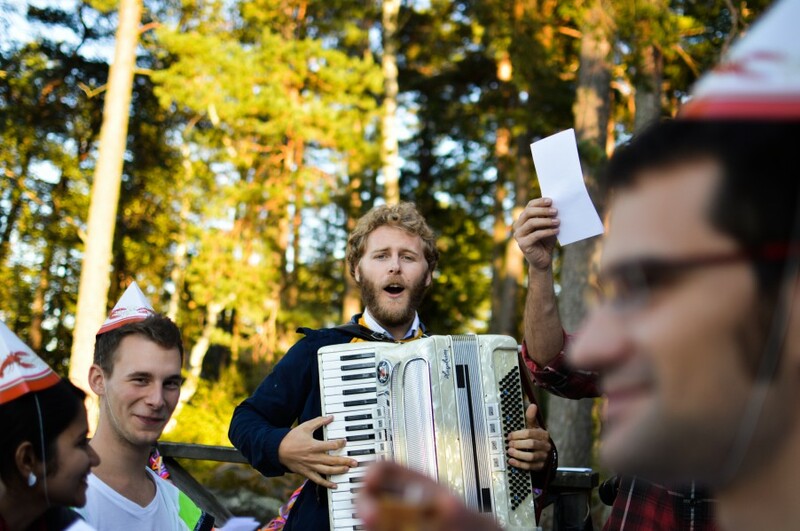 Oh also, we had Peder from GM13 playing the accordion (swedish word Dragspel) for all the songs. He was really sick in the morning but actually came all the way just for the party! Also, the accordion is very heavy and Peder carried it up the hill to the cabin. You can only imagine how special all this made me feel. Oh! and I was also spontaneously nominated President of my class. The title has stuck as well. I have no idea how it happened, I remember that everyone wanted me to give a speech during the party, and I think I said a couple of sentences. I had no idea when I woke up that I was “President”. But anyway, I think Peter posted a reminder on Facebook the next day and then the name stuck. Luckily though, this title comes with no responsibilities! haha just a symbolic thing, which makes it so much more funn! Let’s see some crayfish now. I felt a sense of comfort, identity and belonging. 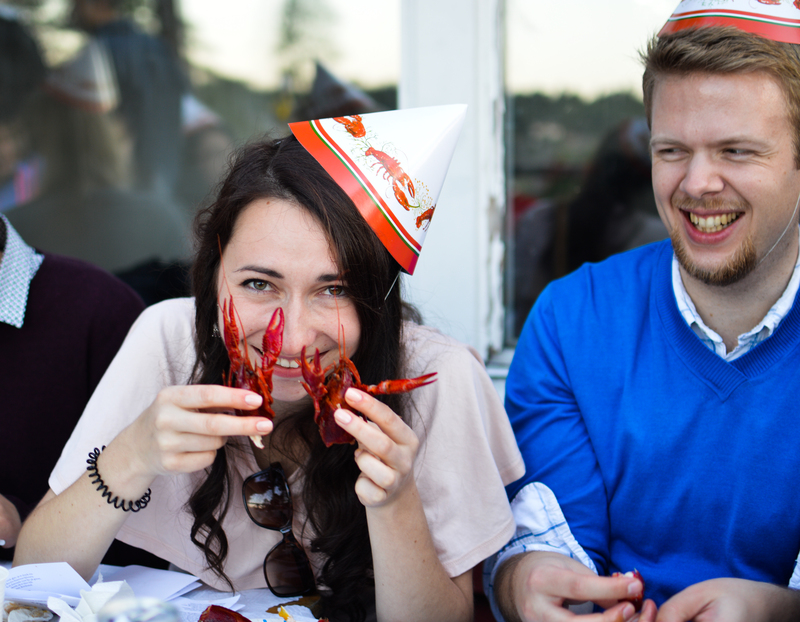 I know it might sound strange to feel all these things at a crayfish party, but I did feel those things. It was not about being liked or disliked but more of being allowed to be myself. I felt I was being listened to, which meant that I was making connections and relationships and not just “networking”. I too was listening to the stories people brought with them. I saw people around me feeling so very happy. I felt that people were opening up and expressing themselves. I did feel that happiness is infectious. In fact, that was the thought I remember waking up to the next day. Remember that it was the first time I was meeting most of the GM13 students but I felt so free of judgement. I really felt very comfortable (some would argue too comfortable: P) being myself, which I believe, is as close to feeling free as it gets. 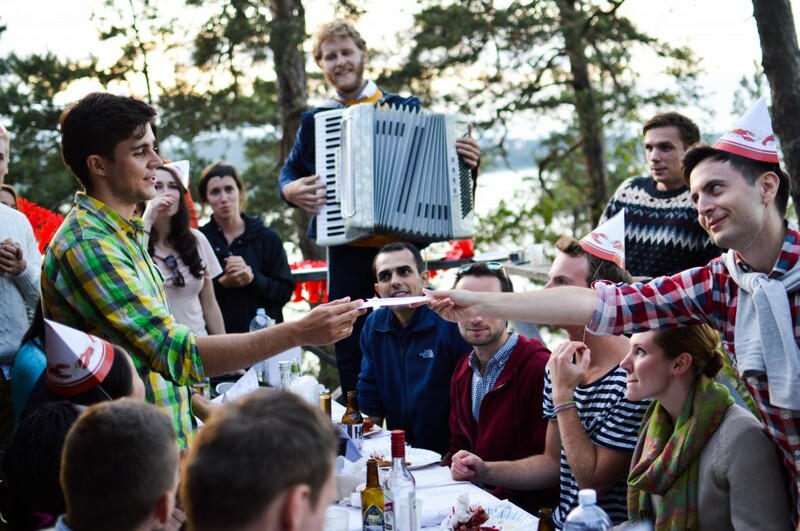 Are you trying to fit in while speaking English in Sweden? Trying to figure out what little speech patterns give away Swedes? 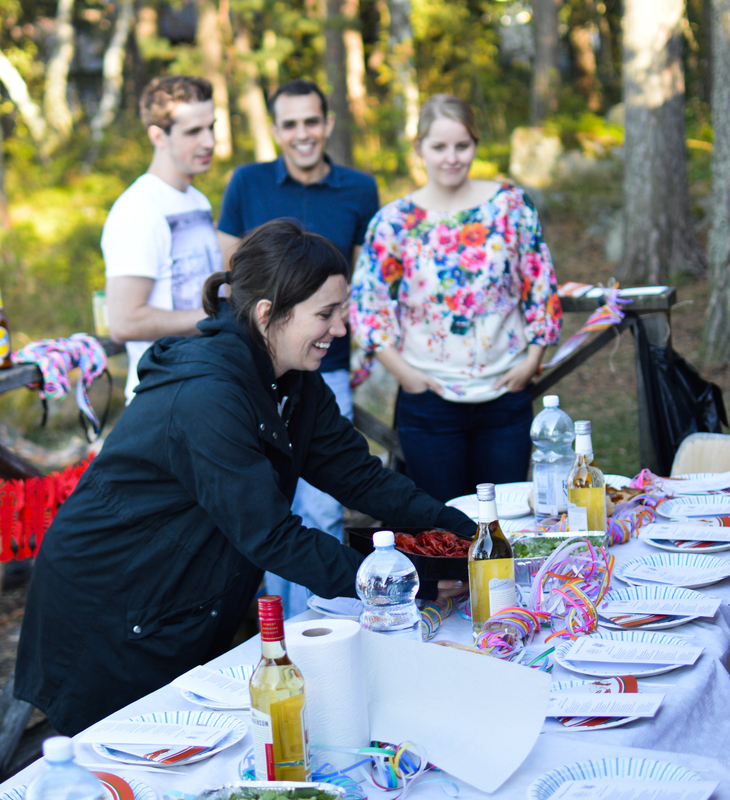 Here are some tips to to help you know a bit about Swenglish! 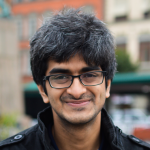 An Indian student studying general management at Stockholm School of Economics. Email me your questions at raghu.digitalambassador (at) gmail.com. 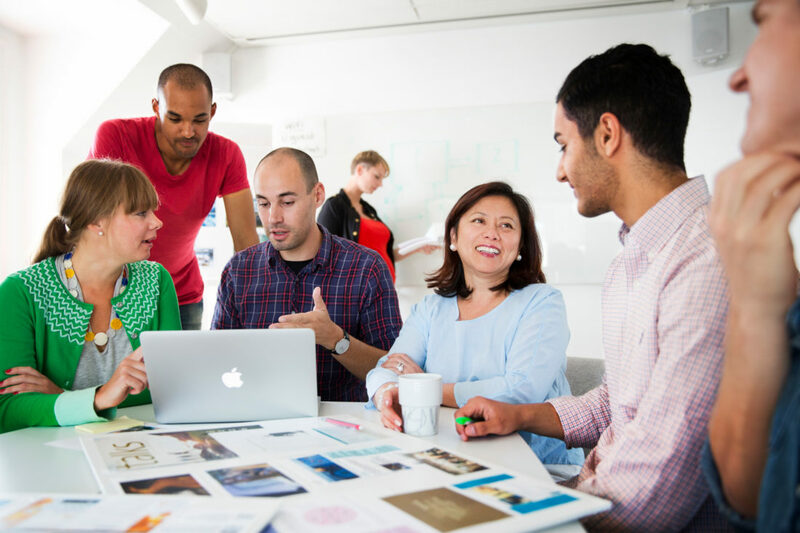 Ett, två, tre… Learning Swedish! Glad to see that u r enjoying your stay here! Hey nice to see you enjoying there. I hope you found a place where you fit in.